On the Wednesday edition of Breitbart News Daily, broadcast live on SiriusXM Patriot Channel 125 from 6AM to 9AM Eastern, Breitbart Editor-in-Chief Alex Marlow will continue our discussion of the Trump administration’s agenda. Dinesh D’Souza, filmmaker and author of the new book The Big Lie: Exposing the Nazi Roots of the American Left, will weigh in on the left’s latest movement to tear down monuments. We’ll also hear from Frank Gaffney of the Center for Security Policy about the escalating tensions with North Korea and his calls for President Trump to fire National Security Adviser H.R. McMaster. Live from London, Rome, and Jerusalem, Breitbart correspondents will provide updates on the latest international news. 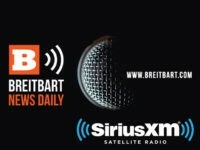 Breitbart News Daily is the first live, conservative radio enterprise to air seven days a week. SiriusXM Vice President for news and talk Dave Gorab called the show “the conservative news show of record.” Follow Breitbart News on Twitter for live updates during the show. Listeners may call into the show at: 866-957-2874.